Visas Avenue has yet again illustrated as to why it is considered as the top Immigration Consultancy Service for Canada. 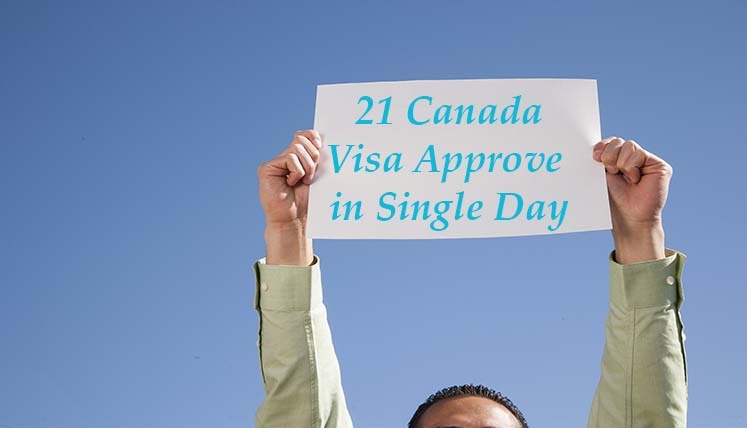 In a miraculous accomplishment on August 19, Visas Avenue obtained 21 Canadian Visa approvals for its clients from the Canada Immigration Authorities. This is indeed a stunning number to achieve for any Visa Consultancy Firm. This impeccable success on clients’ Canadian visa applications has tremendously increased the success rate of Visas Avenue. All the above-mentioned visa approvals received through different Canada immigration programs. This is an interesting stat, especially when see that there are several applicants, who couldn’t get the ITA (invitation to apply) via federal express entry system. The express Entry is the fastest and most popular Canadian immigration system. 6 Canadian visa approvals obtained in a single day in the month of march. 29 Visas Approvals received within just two months (July & July 2017), etc. Such sensational success received due to consistent hard work and client service by the Visas Avenue team. Also Read– 6 Canadian Permanent Residency Visas Grant in a Single Day! What Makes Visas Avenue a Successful Visa And Immigration Consultancy Company? Visas Avenue is a prominent and registered Visa and Immigration Advisory Company in India. It has come a long way over the years to achieve the different milestones year by year month by month. It employs highly qualified and experienced immigration experts and professionals, which have the thorough knowledge of all the major Canada immigration programs. If an applicant doesn’t get success to an express entry system or any other immigration programs the experienced immigration experts often suggest him/her the alternate pathways to get Permanent Residency in Canada. Apart from Canada, Visas Avenue also offers customized immigration solutions for the countries, i.e. Australia, New Zealand, Germany, UK, USA, etc. Also Read- Are you confused About Choosing the Right Immigration Program to Apply Canada PR Visa? Hence, if you seek professional advice, assistance and inclusive support to apply for the visa in Canada, Australia, New Zealand, Germany, etc. countries, you may send your immigration associated queries along with the profile details to the certified Canada migration experts at Visas Avenue on email id- info@visasavenue.com. dear, madam good morning iam from india presently iam working in saudi arabia since 10 yr,s. now iam planning to settle for PR in canada, or newzealand. Thank you for your query, if you are interested in any immigration program or visa category, we request you to forward your queries to enquiry@visasavenue.com. However, Visas Avenue does not offer consultancy on / overseas jobs/work permits/international or domestic placements.